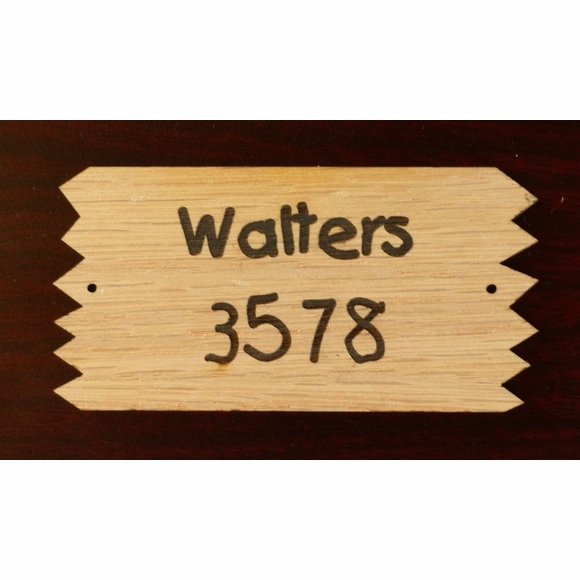 Personalized Cabin Plaque with Address - - rustic theme wood address sign features sawtooth edges on the short ends. Made of real wood, this custom cabin sign holds up to two engraved address lines. Wall mount. 11.5" x 5.5". Made in USA. On the two-line version, Line 1 holds ten (10) 1.5" characters, and Line 2 holds four (4) 3" characters. If you are ordering a one-line sign please leave the Line 2 input box empty. The part number you see in the lower right corner on the sample will not be on your sign. Comes with two 3/16" mounting holes. This real wood product is suitable for outdoor use ONLY when protected with a marine-grade varnish. Before hanging this sign outdoors, please coat it with the varnish!